Finding good replacement foosball table parts can be tough. There’s so many brands, so many different tables, and honestly, not a lot of good places to find them all online. Make sure you’re buying parts that will fit your table! This goes without saying, but it’s not always obvious what pieces will fit what table. Make extra sure you know the make and model you’ve got, and compare that to what you’re buying. It can also help to read reviews or the “Questions” section on Amazon to make sure others have confirmed that it’ll fit on your table. We’ve broken down the most common replacement parts necessary by category, and have done our best to find great places to buy all of them, so you can keep outfitting your table whether a piece breaks, or you just want to make an upgrade. While there’s a little leeway here for you to choose the kind of men you want, you still need to make sure they’re the right size and height for both your rods and your table. While there’s actually a lot on Amazon for you to check out, here are our favorite picks that will work with most popular tables. Made specifically for the ultra popular Tornado tables, I like that you can choose to buy just 6, in case you only need one or two. 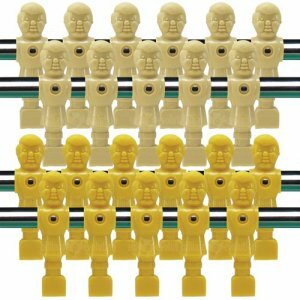 There’s also a pack that includes a full set of men, so you can always update every foosball man on the pitch, but this 6 pack should do it for most people. They’re counterbalanced and of course top Tornado quality, with awesome square “feet” and deep cross hatching for ultimate control. 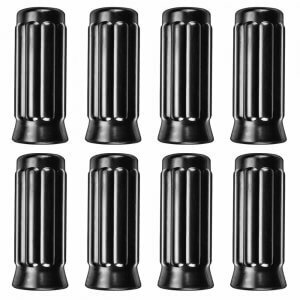 This is a really good, basic set of replacement men that should fit any table with 5/8 inch rods. They have both front and back hatching for better control, but are not counterbalanced, so if you’re looking for the best of the best for serious games, these may not work for you. But, the price is usually pretty good. For most tables, these are a perfect replacement if your men are falling apart/broken/glued together. Dimensions: 4-3/8″ from the top of the head to the bottom of the foot, and 2-7/8″ from the center of the screw hole to the foot. 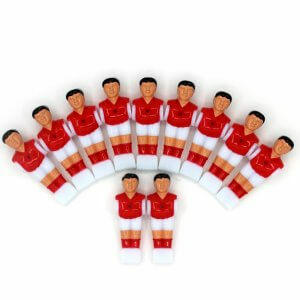 If you’re looking to spruce up the look of your game by adding uniformed foosball dudes, this is a decent option. They’re fairly cheap and have a fairly square “toe box” for control. The plastic is fairly hard, so you should be able to get a good fast game going. Otherwise, nothing special, but they’ll do on most average priced tables. If you’re looking for a more vintage, classic feel, these are absolutely perfect. They give a real 70s feel to your table. Actually, it looks like they are legitimately from 1970s tables. Therefore you may get some scratches or dings, but they’re totally legitimate. They’ll fit most tables with 5/8 inch rods, so you should be able to use them on nearly any decent quality table. I mean, look at them. What could be better than playing a hard match with these guys? Just grow out your mustache, get a sweat band for your hair, and you’ll be ready to play to the max! We’ve included these since I know a lot of you have Hathaway tables, and these are made specifically for those tables. They’re super durable, made out of ABS plastic and come with a 180 day warranty, much like the Hathaway tables. The men come in black and a sort of cream color. Anyway, if you have a Hathaway table, these should do you just fine. These are even harder to come by without going through the manufacturer, but we’ve been able to round up some of the more popular replacement rods on Amazon, where you’ll get a good deal and quick shipping, usually. 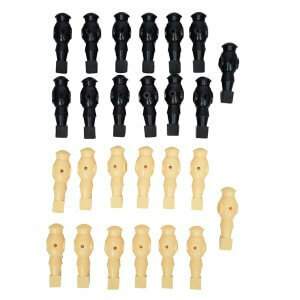 This is a full replacement kit for a Tornado foosball table, which of course are some of the best and most popular tables on the market today. 2 rods of each size are included with this kit, so you’ll have everything you need to outfit an entire game table. They’re hollow brushed steel and are actually the rods that come on the Tornado Tournament 3000 table, so they’re very heavy duty and great quality. If you just want the individual rods, you can get most of them on Amazon here. 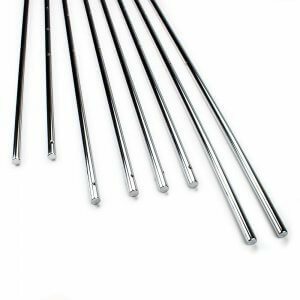 If you’re just looking for basic replacement rods, Brybelly is one of the more popular brands. 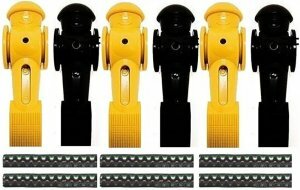 This is a set of 8 rods, so you’ll have everything you need for a full table replacement. 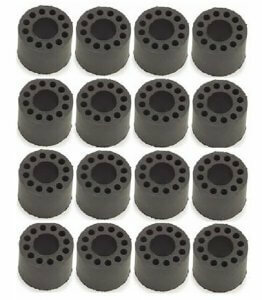 This particular set is solid steel and meant for tables with 5/8″ rod diameter. They’re a very solid and durable set, and should work for most tables. These are the same as the ones above, except they’re hollow. 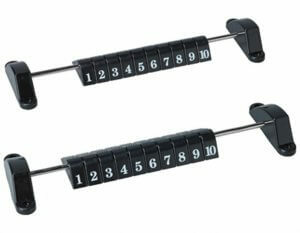 If you prefer a faster game with more feeling coming through the rods, these are for you. Obviously they’re not as sturdy as the solid rods above, but your preference will all depend on how you prefer to play the game. They do seem quite a bit weaker than the solid ones, which, while expected, is not something you necessarily want to notice. 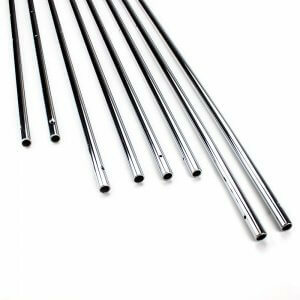 Overall decent replacement rods for your table. These are hard to find in good quality, but there are a couple here that should do you, including genuine Tornado parts for your table. This is a set of 32 bearing halves, or 16 overall, which should give you enough for your entire table if things are getting a bit sticky. They’re genuine Tornado parts and will fit your table if the cabinet is 1 and 1/2 inches thick. These are super high quality, and will make your game feel like new if you’re currently experiencing some play in the rods. Basically, these are the best if you have a table that will fit them. 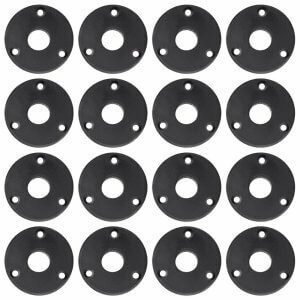 This is a pack of 16 plastic bearings that will fit most foosball tables with 5/8″ diameter rods. You can use one if you have thin side walls or two if you have a thicker table. So, if you do have a thicker table (1 1/4″ or thicker, typically), you’ll need to order two sets (one goes on the outside, one goes on the inside or playing surface side). They’re pretty standard and nothing special, but if you have a cheaper table, these should do the trick. These are actually ball bearings, so will give you a much smoother experience compared to the standard plastic ones above. They fit most tables with 5/8″ rods. It’s a set of 16, so you’ll be able to do your whole table with them. They’re a bit sturdier than the Brybelly ones, and should work for higher end tables. To keep your rods gliding smoothly in the bearings, it can be a huge help to use a silicone lubricant. Oils aren’t that great and can potentially damage the plastic parts on your game table, so one of these is a great option. 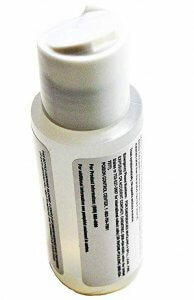 This is definitely the best choice in silicone lubricants. It has a dauber top applicator, which is much better than just trying to use a drip top. Basically, you “paint” the lubricant onto the rods, which means there’s no mess and no clean up. The alternative “eye dropped” styles can drip onto the playing surface and it can be a pain to clean up. If your guys aren’t sliding quite the way they should, this is by far the top choice. Want only Tornado quality across your whole table? Well, you’re in luck, because Tornado makes their own lubricant. It’s really popular, fairly easy to apply since it has a pop-top cap, rather than the eye dropper style applicator, and of course is from Tornado, which means it’s legit. If you don’t want anything that’s not made by the manufacturer, here’s your best bet. Most tables come with a couple balls, but let’s face it…they get beat up and lost pretty easily. Getting replacement balls is also a fun way to try out a different play style, as each manufacturer has a slightly different ball. Some allow for a faster game, while some are “tackier” and allow for greater control. Alright, we’ll stick with the theme here to offer up genuine Tornado parts. These are official Tornado balls, which are known to be fairly fast playing for a tournament ball, though they will give you way more control than the typical hollow plastic replacement balls that are a bit cheaper. 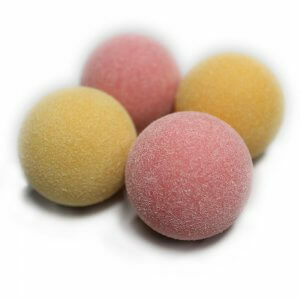 These are 35mm, 0.96 oz balls, and will give you the genuine Tornado feel you’ve come to expect from your amazing table. If you don’t have a Tornado table and aren’t used to playing with balls like this, you will be pleasantly surprised at how much more control they offer, and will allow you to seriously improve your game without having to rely on the “ricochet and pray” method. 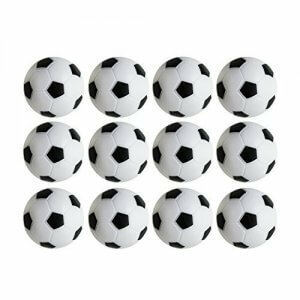 These are your more typical (and cheaper) plastic foosball balls but they’re done up in a fun way to look like actual soccer balls. 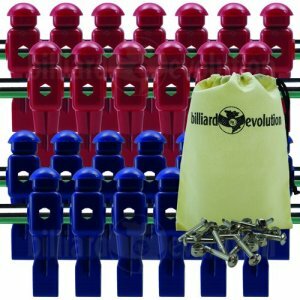 They’re incredibly popular (literally the best selling foosball accessory on Amazon) and fairly good quality, especially for the price. They’re 36 mm and 0.85 ounces, so a hair bigger and a bit lighter than the Tornado balls above. 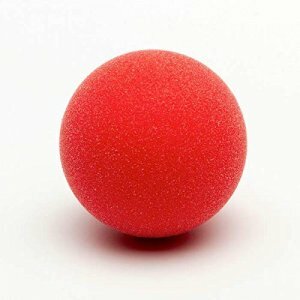 If you just want a bunch of balls with a bit of a cool design on them, you can’t go wrong with these. Alright if you know me or have read our main review page on this site, you know I love the Warrior tables. They’re insanely good quality, Tournament recognized tables at an amazing price. So if you’ve also fallen in love with them, you might want to pick up this set of genuine Warrior balls. They tend to be ever so slightly slower than the Tornado balls (though some will depend on the table you’re using), but they’re amazing for acquiring some more skill in your game. They’ve got good grip and are super fun to use. They’re 35 mm and 0.88 ounces. Are your bumpers getting worn down? It can affect the play of your entire table, and have you lose a bit of control when making cross table plays. It’s a good idea to replace them once in awhile so the stability of your table isn’t jeopardized, and they can help keep your rods from bending. You get 16 of these, so you can redo your whole table. They’re insanely high quality and will fit fine on your Tornado table to bring it back to feeling like new. 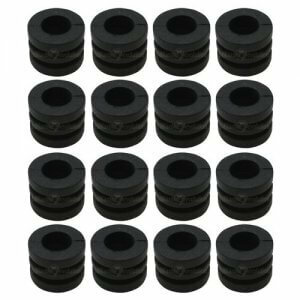 They’re heavy duty rubber and are perfect for 5/8″ rods, measuring 1″ L x 1.25″ W.
Basically, like most things Tornado, they’re the best. 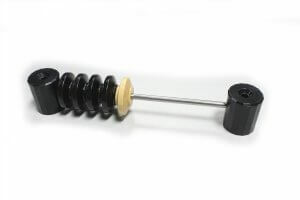 These fit 5/8″ rods, and are a good alternative to the Tornados if you don’t have a Tornado table. They’re quite popular and work on most games. They’re 7/8″ across when on the rod length wise and 1 3/8″ the other way, and are quite stiff so you’ll get a solid feel to your table back. For all non-Tornado tables with the right rod diameter, these should be a good fit. Alright, replacement legs are harder to come by, since it all depends on what table you have. Your best bet is likely to go through your manufacturer, though you may get lucky and find something here on Amazon, or here on eBay. Handles make a huge difference in both your comfort level and game play. There’s wood, plastic, rubber, and grips, which we’ll cover more below, but basically this is up to personal preference and what kind of table you have. These are legitimate Tornado handles in plastic. They also come in wood, but the replacement wooden ones seem to have some manufacturing defects…your mileage may vary, but we recommend the plastic ones. These are actually the ones used on Platinum Tour Edition coin tables and T-3000 non-coin tables. 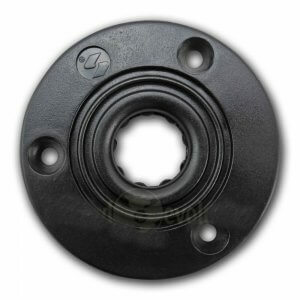 2 7/16″ from inside end of handle to center of mounting hole. You may need to order pins separately depending on the state of yours, but these are some of the top quality handles available today. 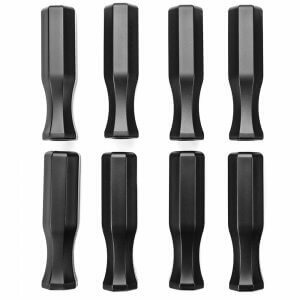 If you don’t need the over-the-top quality of the Tornado handles, these are a good, cheap set of plastic handles with the standard octagonal design. The handle is designed with a nice thumb curve to keep you comfortable even if you’re going hard against a buddy. If budget is a concern, it’s hard to go wrong with these. Don’t like plastic? These rubber ones may feel softer and nicer on your hands. They’re more expensive than plastic, but are still reasonable, and are actually pretty decent quality from a non-table manufacturer. 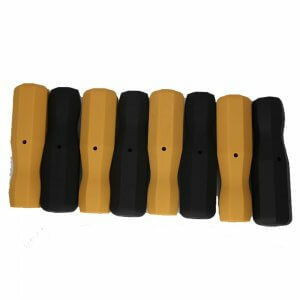 They fit most 5/8″ rods and are quite grippy. Getting serious about the game? You might want to try handle wraps to give yourself some added control and a better feel for faster movement. 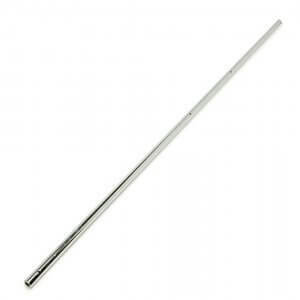 There are also foosball handle tubes, which are typically meant for fishing rods. There’s not a lot out there, but basically you put them over your handles and heat them up and they shrink to conform perfectly to the handles. 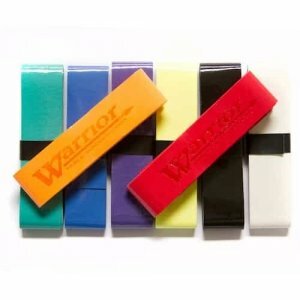 There are a bunch of non-foosball specific wraps that are actually meant for tennis rackets and things like that, but with our favorite company, Warrior, offering up foosball-specific ones, how can we pass that up? This is a set of 8 so you can outfit your entire table. They’re all different colors, so they may actually enhance your gameplay not only because of the hand feel, but because you’ll be able to spot the rod you’re after even quicker in your periphery once you learn which color is for which rod. If you sweat while playing serious games, these will help keep your hands from slipping, and are generally meant for players looking to improve or people who are already pros. Pins are meant to hold the handles and the men onto the rods. If you’re buying new men or handles, these might be useful. We found that the Tornado pins are the best, and actually includes a tool to get them into place, which can be a nightmare if you don’t have the right tool. 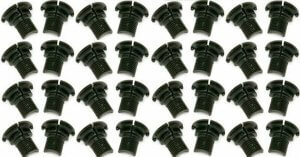 Check out the Tornado pins here on Amazon. A cover can be a great way to increase the life of your table and stop it from getting dinged, scratched, or dirty. If you get a good one, they’re often waterproof (or at least spill resistant). They’re great for indoors if your table is in a busy area of your house, and of course you should get one if you have an outdoor table (though our top pick comes with one already). Anyway, we’ve actually written an entire article on this already, so hop on over to our reviews of the best foosball covers if you need to know which ones are worth your hard earned money! If your table didn’t come with a score keeping unit, or if yours has broken, it can take the competitive spirit out of the game if you don’t keep score. There are a number of decent score keepers, but these two are our favorite. This is a set of two so you can outfit both sides of the table. The rod is 11 1/4″ long, so it’ll fit just about any table you own. They’re plastic, they’re basic, they’re triangular so they won’t flop around on the rod, and are perfect for pretty much any table except the Tornados, which we’ll get to below. Once again, for those of you with Tornado tables, this is what you’re going to need. The classic wooden score discs are what Tornado tables have, and you’ll want an original Tornado product for your table. Super easy to install, they even come with screws. Keep in mind this is only one scoring unit, so if both need replacing, make sure you get two. Some tables already come with inlaid cup holders, or ones that attach to either end, but if yours doesn’t, it can be a great way to make it more party-friendly…or just more competitive if you need to replenish yourself with water throughout your intense games. While there aren’t many foosball-specific drink holders, this one will work if you attach it to the end of your table. 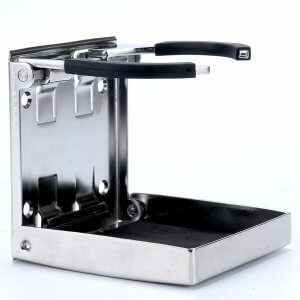 It’s a really nice one actually, and made of high quality, high polished stainless steel. Much better value than a plastic one, which is liable to break during an intense match. If you’re looking for top of the line, this is about as good as you can find, with silicone around the arms (which are adjustable) to hold the drink in place and a foam coaster on the bottom to keep things from spilling. Ah yes, the humble plastic drink holder. Pretty sure my dad had one of these that hooked into the vents in his ’67 Pontiac Parisienne. Anyway, if you just want something that’ll work and isn’t as expensive as the metal one, these will be fine. They’re a fairly decent ABS plastic and even come in a few different colors so you can match them to your table without them looking out of place. Usually you can get away with something like billiard lighting, but that means you’ll have to install it properly over your table. One of the best options to get the light ON your table, is FoosLight. 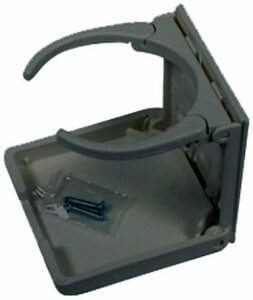 These lighting units attach to the table itself, though they may be back ordered or unavailable. Actually this is a tough find, and we wish it wasn’t. You can always check on Amazon to see if any pop up, or even eBay, though we couldn’t find any currently on sale. If you’re looking for replacement Harvard table parts, check out our article here where we give a rundown on what to look for. Contact the manufacturer of your table, or head on over to Amazon or eBay, which is where we typically look first to get a good price.